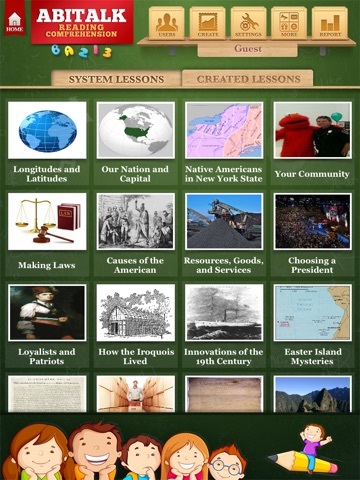 4th-5th Grade Reading Comprehension Social Studies offers 20 passages related to social studies topics from many state curricula around the country, including latitude and longitude, civics, American history, and Native American cultures. The stories are beautifully illustrated with graphics that enhance and engage users, and responses to questions are rewarded or corrected with auditory and visual responses in the practice mode. 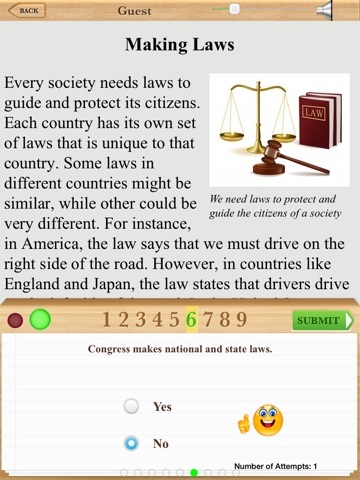 4th-5th Grade Reading Comprehension Social Studies provides a great avenue to individualize reading comprehension practice and review material from social sciences classes at the same time. The content is accurate and interesting for the target age group, and the stories are a good length (700-900 words). Questions provided for each story require a nice mix of concrete, rote recall and higher order comprehension skills. They are multiple choice, matching, or true/false format, so students do not get bored by too much repetition. 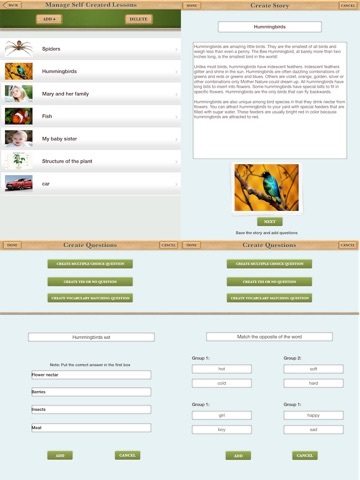 One outstanding feature of this application is the ability for users to add their own content quickly and easily. 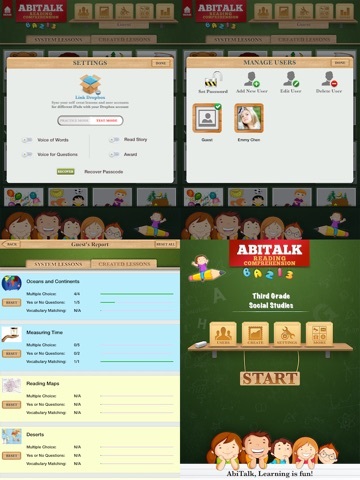 Teachers and parents can add passages, pictures and questions of their own design, so it would be very feasible to custom-design programming for a family or classroom. One caution, however, is in order-there is not an obvious way to delete stories once they are added. Even removing the text of title and passage did not work-I was left with a blank entry that continues to be available to users. The software also offers an extensive record-keeping system so that adult mentors can monitor students’ progress through the passages. The records can be viewed on the Ipad or emailed if desired. Management tools, such as adding new users, can optionally be password protected. It would be nice to be able to protect user records and the content entry system a the same time, because these functions should not necessarily be available to all users. One problem with 4th-5th Grade Reading Comprehension Social Studies is the passage level difficulty. Two passages of the twenty were checked for readability, and tested at the upper 8th grade and middle 9th grade levels respectively (using Flesch-Kincaid calculations). This may be too difficult for some students with grade placements at fourth or fifth grade, and may well frustrate any struggling readers. The sentences are frequently long and complex and the vocabulary difficult. The authors did a good job of defining the subject-specific vocabulary in context, but words like “horizontal” and “dedication” (listed as grade 7 words in EDL Core Vocabularies) are not defined and make reading difficult. Developers did include a system where touching difficult words gives the pronunciation, but this won’t help a student who is unclear about the meanings. 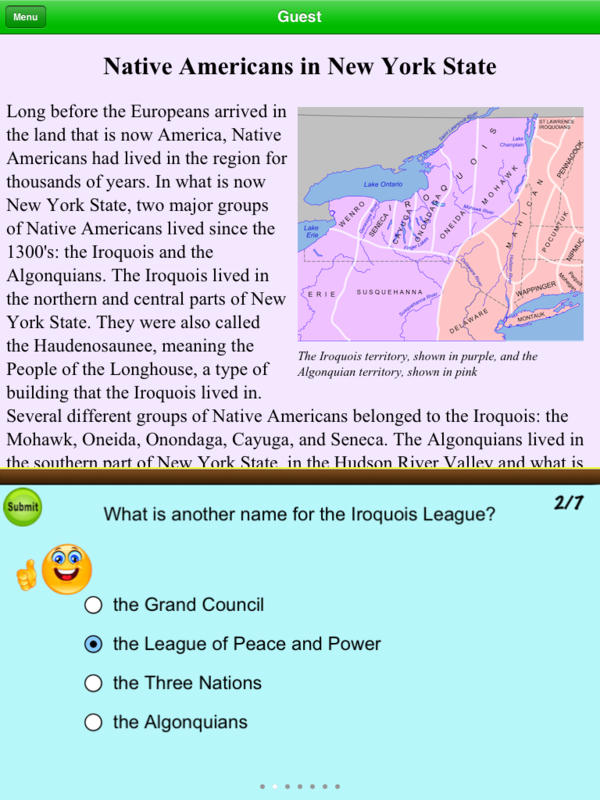 4th-5th Grade Reading Comprehension Social Studies passages are intriguing and entertaining for the target age group (9-11 years of age). Each is illustrated with a photo that complements the content, making the stories more engaging. The Practice Mode features immediate feedback for each question in auditory and visual form. The Test Mode puts a timer onto the system that can help instill a sense of competition for some students. The option to add passages, graphics and questions makes it very easy to individualize the content and tailor it to a particular student’s preferences. For example, if a reluctant reader was interested in airplanes, parents or teachers can easily add content about airplanes that will keep the student’s interest. The included twenty passages will keep students busy for several rounds of play. Records can be reset, as well, so the same student could redo passages as often as parents or teachers feel is appropriate. The real clincher in the value department, though, is the capability to allow users to input their own material. This makes the application useful for almost any circumstances and vastly improves options for individualized content that meets specific student needs. Content can be transferred from Ipad to Ipad using Dropbox, as well, so a teacher working with a larger group need not feel that the passages would have to be duplicated on each device. 4th-5th Grade Reading Comprehension Social Studies includes no outside advertising and no direct links to the internet. There are several systems that open emails, such as to product support, a newsletter subscription, and to send progress reports to teachers or parents. There are no links to social media, and one page that lists other products from Abitalk with links to purchase them from the App Store. The front page of the app also includes a “Message Center” where app developers send information about updates and other products that includes links to the App Store. The Manage Accounts section has an optional password system that can be activated by users. This can be set up by adult users to protect the ability to add, change or delete users, access Dropbox, and change the app’s mode between Practice and Test operation. One problem is that if a child were to set this up maliciously, it might prevent adult users from accessing these features. The password can be removed from inside the Manage Accounts system, but I’m not a bit sure what one would do if a password were to be forgotten or set up fraudulently. It might be a good idea to set a password before allowing students to use the system, just to be on the safe side.